Uber CEO Travis Kalanick and Menlo Ventures investor Shervin Pishevar, a backer of the on-demand limo company, witnessed the reuniting of two rap icons that have been at odds since the 90s: Snoop Dogg and Suge Knight. The group was spotted Monday night at AV Club in Los Angeles. 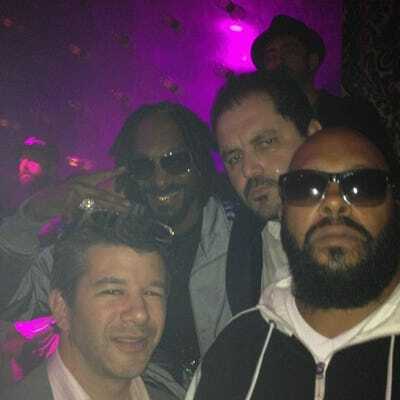 “N d club wit Suge miss those death row days!” Snoop posted along with the photo to Instagram. Seeing Knight and Snoop together is so surprising, the Instagram photo is making the rounds on TMZ and MTV. None of the gossip sites took note of Kalanick or Pishevar, however—much like the Daily Mail struggled to place Square’s Jack Dorsey on that yacht with a model. Why the rift between Snoop and Knight? Snoop Dogg was once signed as an artist under Death Row Records, Suge Knight’s label. Knight was eventually sentenced to 9 years in prison for assault charges after a fight broke out in a Vegas hotel room. That same night, Tupac Shakur was killed. Knight was released from prison after serving five years of the term. This is the first time anyone has seen the two together in years. Which still leaves us wondering, what are two well-respected Silicon Valley tech guys doing in this picture—building businesses or tasting fame?